In this eye-opening tour of milestones in the history of our universe, Chris Impey guides us through space and time, leading us from the familiar sights of the night sky to the dazzlingly strange aftermath of the Big Bang. What if we could look into space and see not only our place in the universe but also how we came to be here? As it happens, we can. Because it takes time for light to travel, we see more and more distant regions of the universe as they were in the successively greater past. Impey uses this concept—"look-back time"—to take us on an intergalactic tour that is simultaneously out in space and back in time. Performing a type of cosmic archaeology, Impey brilliantly describes the astronomical clues that scientists have used to solve fascinating mysteries about the origins and development of our universe. The milestones on this journey range from the nearby to the remote: We travel from the Moon, Jupiter, and the black hole at the heart of our galaxy all the way to the first star, the first ray of light, and even the strange, roiling conditions of the infant universe, an intense and volatile environment in which matter was created from pure energy. His lucid, wonderfully engaging scientific discussions bring us to the brink of modern cosmology and physics, illuminating such mind-bending concepts as invisible dimensions, timelessness, and multiple universes. Chapters include: Planetary Zoo; Distant Worlds; Stellar Nursery; The Edge of Darkness; Island Universe; The Growth of Galaxies; Light and Life; Big Bang; White Heat; Something Rather Than Nothing; Unification and Inflation; Multiverse; tons more. Published at $24.99, our price: $14.95. 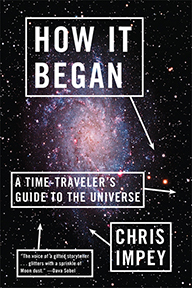 HOW IT BEGAN A Time-Traveler’s Guide to the Universe by Chris Impey. 432 pages. 6x8 Hardrback. Illustrated. Index.